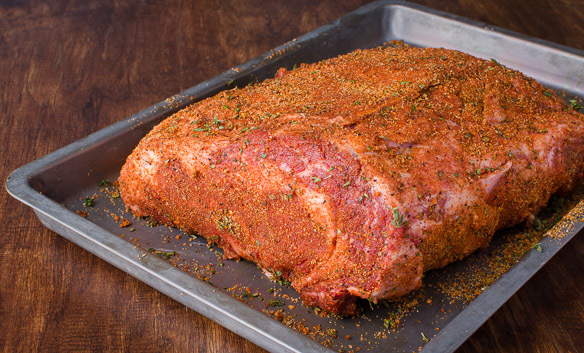 My pink to the edge, perfectly medium rare, super juicy, and kissed-with-smoke salty herbaceous crust prime rib has been a family favorite for many years, long even before I started winning barbecue championships. 6. How do I choose a good one? Purchase the best grade you can afford. Prime is best and Choice is also very good. If money is no object, the best tasting ones I’ve had are 28 day aged Wagyu prime grade corn-finished rib roast. I prefer the usual grass-fed and grain-finished beef versus the all grass-fed and grass-finished. Your individual preferences will vary. If you are selecting them yourself, carefully examine every roast they have in the store and pick them based on the amount of flecks of fat you see on the cut side. 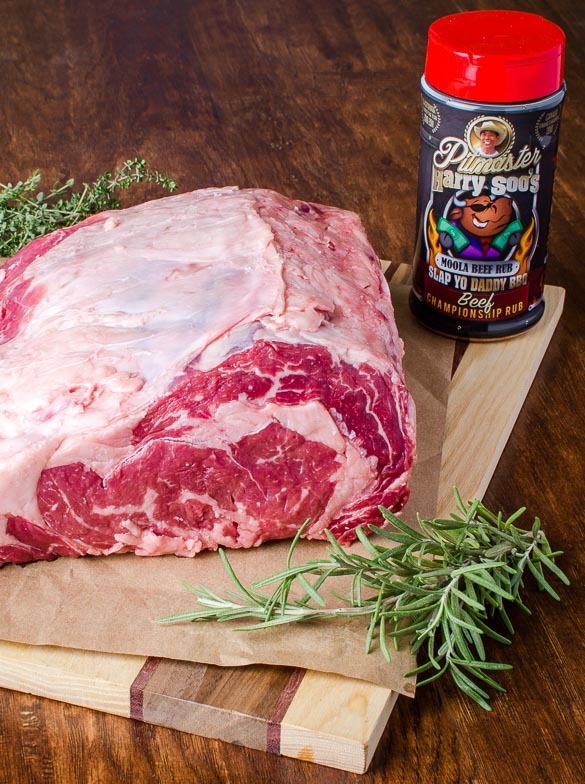 Fat equals flavor so look for a well-marbled roast with lots of white flecks on the side and striations of fat along the length. 13. How much will it cost me? Beef prices in the US vary depending on market forces of supply and demand. I’ve seen nice ungraded rib roasts for $3.99 per pound in Safeway or Stater Brothers; at the time I wrote this article, expect to pay $7 to $12 per pound for Choice and $9 to $20 per pound for Prime; for top-grade Wagyu, don’t be surprised to see $50-$80 per pound. 15. How long do you leave the rub on before cooking? I find dry-brine approach works best and one hour is good and overnight is best. 17. 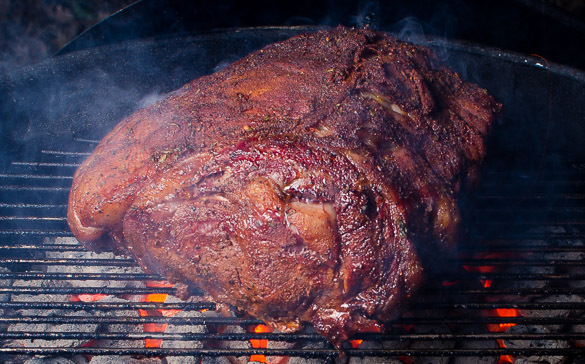 Do you have a perfect smoked prime rib recipe? Funny you should ask . . .
Char or sear the rib roast over direct fire. Move to the side if it flames too much from the oil dripping on the fire. Alternatively, you can spray water from a water bottle. Pull when internal is 135F. Rest under a loose foil tent for 30 minutes before serving. Save the juices and add it to any au jus you are preparing. I make an instant au jus from this concentrated product which is sold by my rub partner David Siervers of soupbase.com. 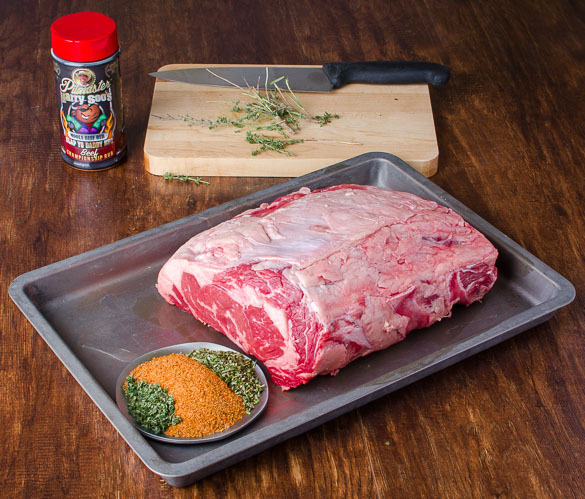 It’s really easy to use and IMHO has the best tasting beef flavor without any work and you just add hot water. Just some quick questions! Never done a prime rib roast before. Is there any kind of silver skin that needs to be peeled off prior to cooking? And should any of the fat be trimmed off? Thanks for another great recipe! No need to trim off any silver skin or membrane on the prime rib. Leave the fat on. Good luck! I decided to smoke the prime rib for our Christmas dinner this year. I followed Harry’s instructions for a Perfectly Smoked Prime rib and it came out awesome. It was so delicious, everyone loved it and it also had just the right amount of smoke. I don’t think I’ll ever cook another one in the oven again. Than you Harry. Made this over the weekend for a Thanksgiving Day celebration. Super easy and turned out great. Not sure why all Prime Rib Roast isn’t smoked! THanks, Harry! Good point Brian. 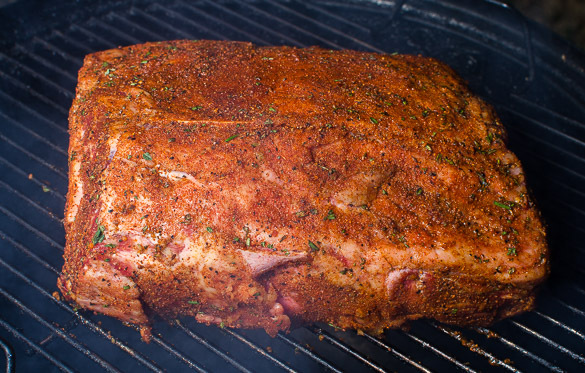 You get all that "Kissed By Smoke" goodness when you cook the prime rib in your pit. Go tell the world that it’s "Mo-Better in the pit with Butter!" I ordered a boneless prime rib roast, but I won’t know the weight until I pick it up. If I set my pit at 200F, approximately how many minutes per pound am I looking at to get me to the 110F range so I can then sear it? I would plan for about 40-50 minutes per lb at 200F. It depends on several factors including how much air circulation is in your pit and the starting meat temp. For example, if you took it our at 34F from the fridge, it would take longer than if it was at room temp. Remember that you can cook ahead and hold the prime rib at 140F oven or wrap in towels in an igloo indefinitely until your party starts. I would get it cooked and out of the way so you can focus on cooking all the other items you are making. Hello Harry, I Like your article and have some advise for those that want it medium and well done. 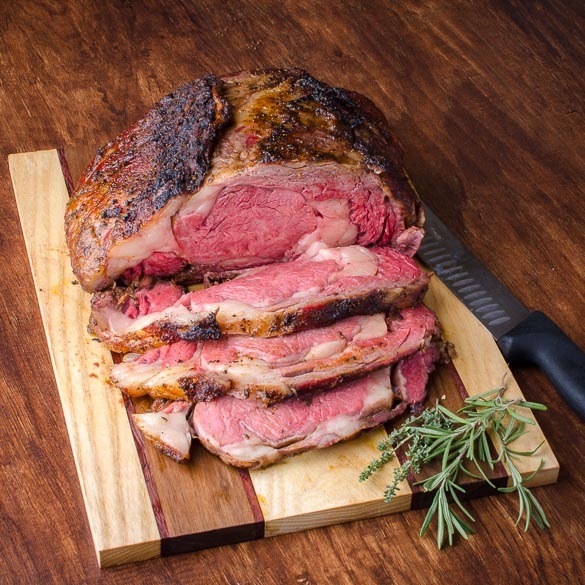 I cook over 100 Prime Rib Roasts a year and always cook to rare/medium rare pulling the roast at 120F and resting in a holding box or cooler for at least 1 hour up to 5 hours before slicing. I make a dark au jus to colorize slices for the guests who prefer med to well done, (the au jus covers the pink making it appear well done but in reality it is colored med rare). 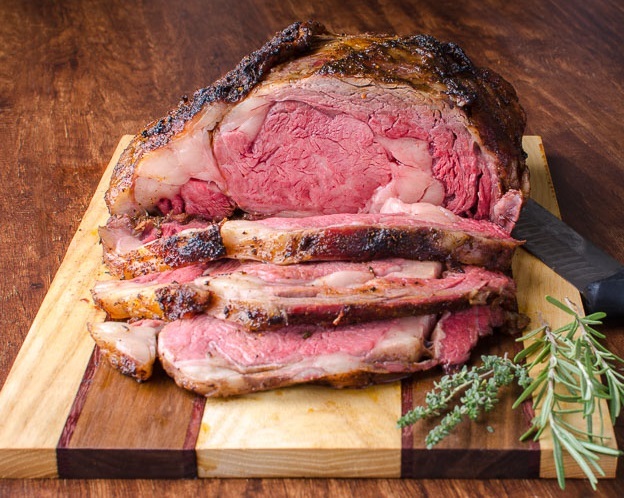 I get many compliments and raves of the most tender and juicy prime rib the well done lovers have ever had. Hope this gives your readers another option. Merry Christmas to You and Donna! Looking forward to smoking my first prime rib, just wondering if I am still using water pan on my WSM18? Harry, can I get some clarification on temps. The information above explains that you remove at 110F and then sear until 125F. I usually go to 128F. In the instructions it says to smoke to 125F and sear to 135F. That will definitely be beyond medium rare. when smoking do you use the water pan? Recommend I smoke it for rare? Thank you! I would appreciate any comments! Do you remove the outer fat cap on the prime rib? If not why? OMG Harry!!! Made a Version of This Last Night on 22" Weber C/W Slow & Sear, It Was Fantastic! My guests prefer medium. I will purchase a 4 pond boneless prime rib. What is the internal temperature? And how long in the smoker? 145F for medium. About 4-5 hours @200F in smoker for 10 lb roast. We are traveling and I plan to smoke the prime rib on Sat and bring to serve on Sun. Thinking if we will re-heat on grill to serve. Any concerns or suggestions? Cook until medium rare 135F. Chill and reheat in 275F oven until internal is 140F. It’ll be perfect.